For much of the history of civilization, the relationship between food supply and population growth has been inseparable in cause and effect. There were long periods of relative stagnation and some leaps forward, but there was always the concern if food production could keep up with population (see LT Evans, 1998, and V Smil, 2001). Most people in the world today have access to adequate food. Some regions of the world still suffer shortages often related to civil disruptions, while chronic malnutrition plagues some 12% of the world’s population, but this situation is improving. Looking at trends from large sets of data on population, resources and food production shows there are good reasons to be optimistic about our ability to meet the food requirements of the projected 9-10 billion people on our planet by the middle of this century. It also appears we are getting smarter in several ways about how to do this with sparing further land from conversion to agriculture. In his book Feeding the Ten Billion, LT Evans unfolds an enlightening history of population growth and agricultural innovation. The figure above is an update of one of his originals, showing the relation between global population and important factors of agricultural productivity. The horizontal axis and the left-inside vertical axis are scaled at 1:1 for world population with the horizontal axis also showing the approximate year the population reached another billion. The data from 1961 on is available online from FAOSTAT. (Note: In the updated figure I used area equipped for irrigation as it was more complete than the data set for area actually irrigated). The green line that closely follows the population line shows that average cereal yield has increased at a rate similar to population growth. The dominant cereals based on global production are rice, wheat, maize and barley. Rice and wheat were the two main Green Revolution cereals whose large yield increases beginning in the late 1960s are attributed to dwarfing genes along with fertilizer and herbicide inputs. The wheat dwarfing genes introduced by Nobel laureate Norman Borlaug put more of the plants energy into making seed rather than stalk. The shorter plants were better able to respond to nitrogen fertilizer without falling over (lodging), producing higher yields further boosted by improved weed control. They were also bred for disease-resistance. Crop land that can be irrigated generally produces higher and more reliable yields, and it now occupies about 23% of the arable land in the world. The blue line on the graph reflects its steady increase since the 1960s. In 2012, 71% of the world’s arable area that is equipped for irrigation was in Asia. The dramatic rise in use of nitrogenous fertilizer (purple line) reflects its relatively cheap price for many years and its demand as the nutrient used in the largest amount. While its use is essential to obtain high yields (with the exception of legumes), increasingly inefficient use at high rates of application has led to significant environmental problems. Adoption of practices achieving more precise and efficient use of nitrogen fertilizer is urgently needed. 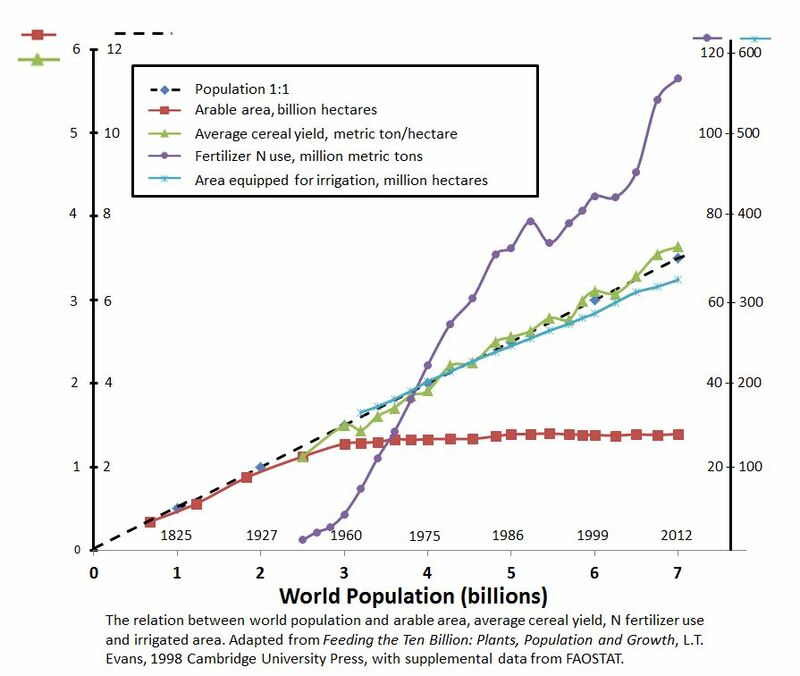 Total arable area in the world (red line) on which our food is produced stands out as having changed the least among the productivity factors. It has remained basically unchanged over the past 25 years at about 1.39 billion hectares (3.43 billion acres). This is quite remarkable considering that during that period the world’s population increased from 3 to 7 billion. This outcome is a result of the integration of the other productivity inputs and a myriad of other efficiencies in farming, transportation, storage, etc. A brilliant analysis of the past quarter-century’s stability of global farm land area and its implications is found in Peak Farmland and the Prospect for Land Sparing by Ausubel, Wernick and Waggoner. The authors propose that we have reached Peak Farmland largely as a result of moderation of population, evolving tastes and improving agricultural practices. Huge amounts of land have been spared from agriculture as a result. They even predict that hundreds of millions of hectares under the plow will become available as habitat for wildlife or carbon orchards. 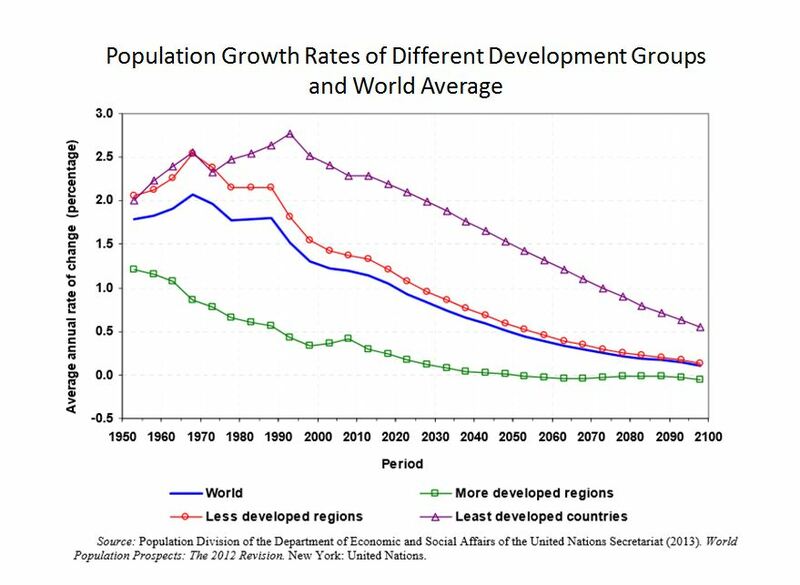 Much of the growth in population projected by mid-century will occur in Asia and Africa. As seen above, the 40 year trend in consumption of fertilizers is dominated by Asia’s agricultural intensification to address increased food production for their growing population. As of 2014, developing countries in Asia and Latin America account for almost two-thirds of global fertilizer consumption (Potash Corp). 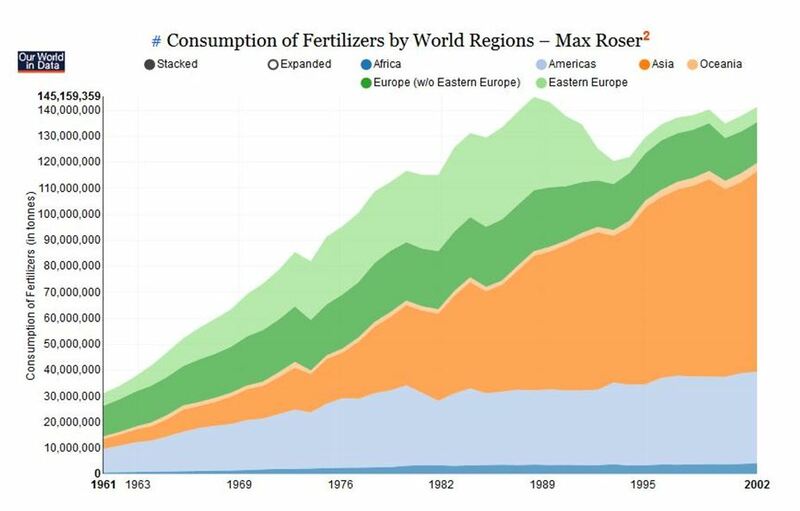 Barely noticeable at the bottom of Roser’s chart is Africa’s miniscule use of fertilizers. While the past decade has seen increased use, Africa will still have to markedly increase nutrient inputs to drive up their crop yields to address its food insecurity. Africa currently accounts for less than 3 percent of global fertilizer consumption despite having 15 percent of the population (Potash Corp). Asia and Africa are already net importers of food and the amounts they import have steadily increased over the past 35 years. The big picture is that North and South America, Australia and Russia are exporting increasing amounts of food to Central America, Europe, Asia, the Middle East and Africa. This will likely not change quickly, implying that exporting countries will continue to lead the way in productivity innovations for some time while the importers catch up. Increasing the productivity of cropland will require even more efficient use of land, water, nutrients and other inputs, including genetic resources. FAO estimates indicate that to meet the projected demand, global food production will have to increase by 70 percent. Evans noted that further rises in crop yields in the absence of further expansion of arable land will come partly from plant breeding and partly from agronomic improvements in the use of resources as substitutes for land. Plant breeding now includes genetic engineering which in addition to contributing to yield increases per se and pest and disease resistance can help address some of the challenges with resources by developing water and nutrient use efficient crops. Governments, policy makers and the public need to better understand the reasons behind the progress that has been made in global food production, and support the use of genetic engineering as a modern plant breeding tool which can help continue this progress. The Green Revolution began with dwarfing genes in wheat and rice, and it will likely continue with other genes that improve yields and resource use efficiency. To accomplish this without farming more land and even giving land back to nature will be a remarkable achievement. 1 Arable land is defined by FAO as land under temporary agricultural crops (multiple-cropped areas are counted only once), temporary meadows for mowing or pasture, land under market and kitchen gardens and land temporarily fallow (less than five years). The abandoned land resulting from shifting cultivation is not included in this category. Data for Arable land are not meant to indicate the amount of land that is potentially cultivable. 2 The data is taken from the FAO’s Fertilizer Archive online here. It is the series on ‘Consumption (tonnes)’ of ‘Total Fertilizers’. L.T. Evans. 1998. Feeding the Ten Billion: Plants and Population Growth. Cambridge University Press. V. Smil. 2001. Feeding the World: A Challenge for the Twenty-First Century. The MIT Press. J.E. Cohen. 1995. How Many People Can the Earth Support? W.W. Norton & Company. J.H. Ausubel, I.K. Wernick and P.E. Waggoner. 2012. Peak Farmland and the Prospect for Land Sparing. Population and Development Review 38:221-242. L.V. Giddings, M Stepp and M. Caine. 2013. Feeding the Planet in a Warming World: Building Resilient Agriculture through Innovation. The Information Technology & Innovation Foundation and the London School of Economics and Political Science, April 2013 Report, 35 pages. N.V. Fedoroff et al. 2010. Radically Rethinking Agriculture for the 21st Century. Science 327:833-834. Food and Agriculture Organization of the UN. 2009. How to Feed the World in 2050. High-Level Expert Forum report, 35 pages.